DCUC Wave 20 Collect and Connect: The Choice is Ours! One of the announcements in the news-heavy TOYFARE #157 was that Wave 20 of DC Universe Classics will feature another Fan's Choice poll, but in a bit of a twist, the choice this time is not a single figure, but the Collect and Connect character that holds the wave together! 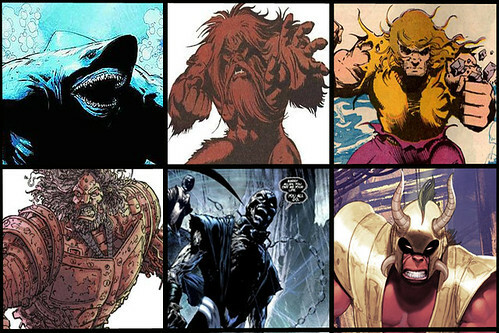 The choices we can vote on are: Blockbuster, Girder, King Shark, Nekron, Shaggy Man and Wildebeest. An interesting selection, which the cynic might say is heavily weighted towards Nekron in the wake of BLACKEST NIGHT. Odd, too, since it seems Nekron would make a great choice for a Green Lantern Classics Wave. Still, I'm holding out hope that one of the more classic characters like Blockbuster or Shaggy Man will come good, as it would be great to see them get the nod! 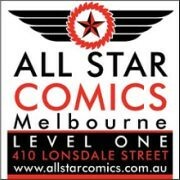 Most importantly, go to www.wizardworld.com to have your say before 31 August, but while you're at it, jump over to our own fan poll on the top left of the site to give us an idea of how you'd vote! You can discuss this at the AFB Forum, and comment on this post to enter the July AFB Comment of the Month Contest! Seems pretty weighted to me. While I'd rather Blockbuster or Shaggy Man, the inclusion of Nekron in a poll featuring lesser known characters means that's who Matty's looking to make. He's fresh off a super hot crossover, and is likely the only character much of Toyfare's readers have heard of. A shame, really. I'm sure that Mattel will make Nekron in his Blackest Night look, which would make him a better candidate for the GL Classics line, leaving the DCU line one of the other choices. Now, we'll have to wait longer to get one of the other characters in figure form. we all know deep inside that we want a huge mutated hummanoid shark! These seem to be 'C' list guys and I hope that means choices like "Lead" and "Elastigirl" are shoe-ins for later waves? Voted! I need a Blockbuster for my Batman's rogue display... GO Blocky! I voted for Shaggy Man....because Xeen Arrow wasn't offered. Well, as cool as Shaggy Man is, I will vote Blockbuster and hope there will be enough fans to sway the vote to someone not Nekron. No problem with him, just I like Block and Shaggy. my choice was block buster for one to have one of the few bat rogues that can fight batman to almost a stand still plus he would make a nice addition to a suicide squad shelf. though Girder would mean flash got some more loving. hope fuly block buster pulls off a upset and wins the thing. I'm a GA fan, what can I say. Where's the love for Xeen Arrow? Sure, he only appeared in one story; but that's one of the most frequently-reprinted stories of the Silver Age! It's been reprinted five times since the original publication; I'm pretty sure it's either tied with or ahead of Green Arrow's Silver-Age origin and the story where he gets his new costume! While I'd love to have a Nekron figure, I'd hate to have to buy 6 or so figures that don't interest me in order to get him... Bah. That's what I get for keeping my only DC interests close to the Green Lantern franchise.